VOGONS • View topic - Trying to add Amstrad PC1512 special video mode. Trying to add Amstrad PC1512 special video mode. Hi, I've got the DOSBox source compiling in VS2003 and I'm trying to add the Amstrad PC1512's special 640*200*16 colour mode (their own extension to CGA). That's what the mysterious INT 15h AH=06h is for - detecting the PC1512. I've got it partially working, but I've not had much luck with Mobygames' list of "Amstrad video mode" titles. Only two of them (Feud and Maupiti Island) actually seem to support the mode and both of them have EGA modes anyway. It looks like most of the games are only interested in Amstrad's proprietary mouse and digital joystick. On the applications side, Dpaint and GEM/2 (or GEM/3) support the video mode, but... erm... that's it. I've tried these 10 http://www.mobygames.com/browse/games/dos/tic,2/ti,53/ and Prohibition. Anyone know any other games that might support the video mode (to save my blushes)? Also, is there any demand for this sort of thing? Re: Trying to add Amstrad PC1512 special video mode. If you need guidance maybe the author could be of some help, although I don't know if this emulator supports the 640x200x16 graphic mode yet. In 7 years of PC1512 usage, I only came across two pieces of software that used the mode (other than programs written in BASIC 2 and programs I had written myself). Dragonfly is a game that uses the mode for its title screen (the game itself uses a standard CGA mode). Flags supports EGA and VGA as well. It's author (Novella Software) also produced a Turbo C library for programming the mode. Thanks for the games and the link to PCem! I've emailed the author to see if he knows of any. MCGA, VGA, 8514/a, XGA, VESA and Super-VGA adapters including hi-color SVGAs. jmk wrote: Thanks for the games and the link to PCem! I've emailed the author to see if he knows of any. One more: Frank Bruno's Boxing (http://www.mobygames.com/game/dos/frank ... Id,649379/). This is a weird one because it doesn't use the mode to its full effect. I believe the reason is that it's a direct conversion from a Spectrum game with no upgrade to the graphics. but even then it doesn't list them all, l'affaire & prohibition by infogrames are two that have amstrad video options not noted by moby. The confusion may be occurring because a lot (all?) 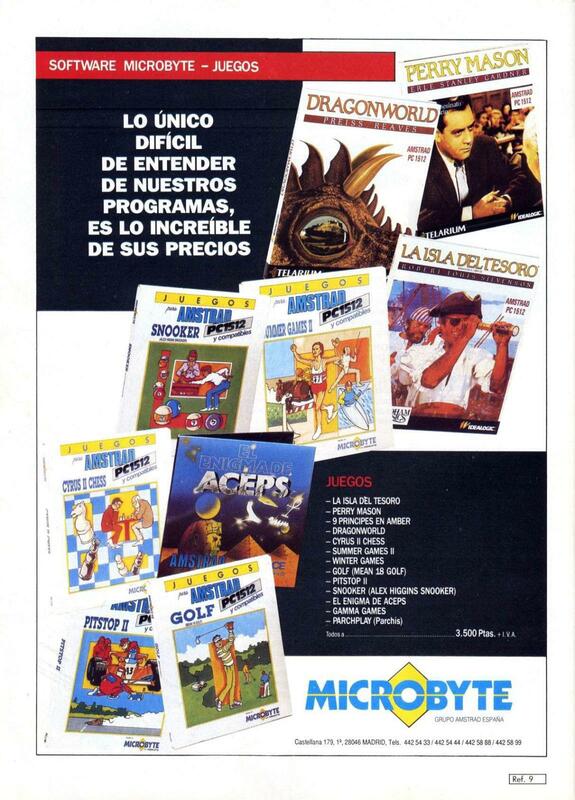 of those games have Amstrad CPC versions. So somebody sees "for PC/Amstrad/Spectrum/C64" (or whatever) on the box or advert and ticks the "Amstrad video mode" option when adding it to Mobygames, not realizing that Amstrad CPC and the special Amstrad PC1512 video mode are completely separate things. Deluxe Paint II supports the Amstrad mode, and there is an Amstrad PC1512 driver for Sierra SCI0 games. They work nicely in DOSBox SVN Daum. The game itself is pretty cool, a sort of missing link between text and graphic adventures. 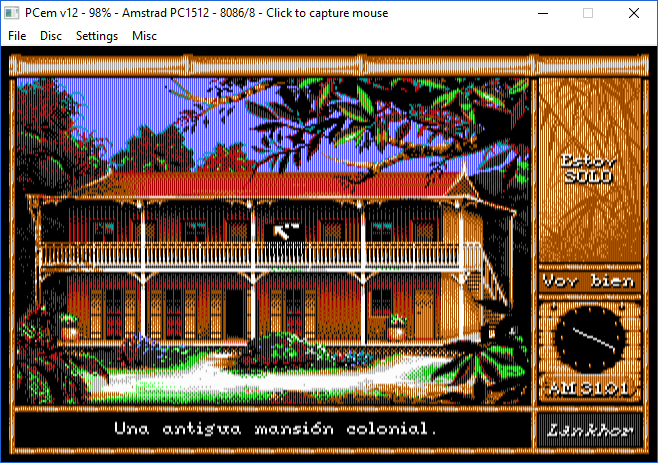 Feud shows the same graphics with Tandy and EGA, while Maupiti Island shows the same graphics with EGA. Slightly off-topic, but some games support the Amstrad-specific digital joystick interface, even if they don't support any additional graphics. Wizball comes to mind. Note that those games, on the upper right part of the ad, aren't announced for "PC1512 and compatibles", but only for the PC1512, which makes me think they make use of their special modes. Unfortunately none of those games has been preserved, so I can't confirm it. It is not impossible, but the Amstrad PC-1512 was like the Tandy 1000 of many European countries, the first IBM PC compatible that was close to 100% compatible and sold for consumer-affordable prices. Amstrad hit it big as a result. The PC-1512 has its quirks when it came to CGA graphics, so putting PC-1512 compatible on your box eliminated any doubt of whether your software would work on the most popular PC-compatible being sold. Yeah, I think I'm inclined to agree here. Putting PC1512 on the box was just a measure of compatibility. If you look at some titles sold by Tandy/Radio Shack, they're the exact same titles as before but they have a round "Tandy 1000" sticker on the box. Sometimes this did mean they had extra graphics and sound, but it was usually just a branding/marketing/publishing thing. Also, it's important to note that magazine ads were submitted several months before the publication of a magazine, and there have been some instances where a product is advertised that never actually made it to market. Yes, what you both say is completely plausible. If any of those games ends up appearing I'll post about it. I'm intrigued by this "Dragonfly" game. Who made it? I assume (from the file date) it was produced in 1994? I assume it supports the Amstrad digital joystick too?